Don't worry I'm not going to get burned out, I'm taking this easy. The most stressing part is actually the beta testing. So when CL beta enters the final stages (when people post pages of bugs) I'll take a break from PS2. But until now, I think is a good idea since my mind is fresh of RPG design and will be easier to remember how I coded the others. Then I'll proceed with the RPG design which will probably keep me busy for 2-3 months minimum. I'll reuse the same framework, since Anima unfortunately can't work on it as soon as needed, however I think it should be perfectly fine. 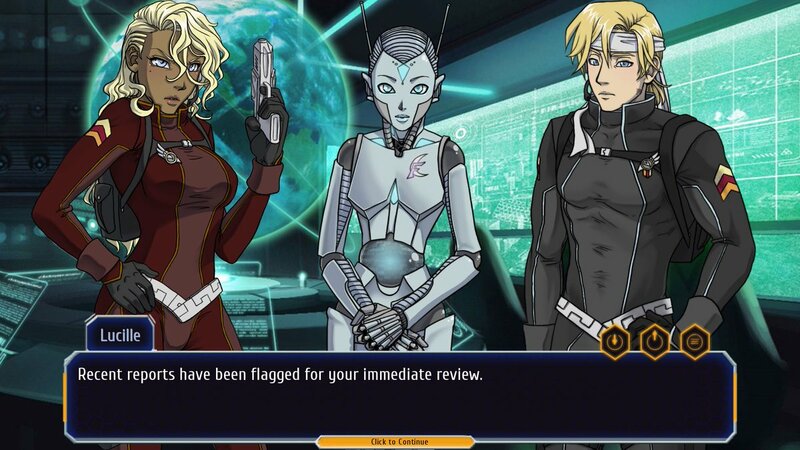 People even liked the first game combat, so... this one should be better anyway I hope. I'm keeping the design notes Anima posted with some minor tweaks - for example I'm not going to keep the ammo thing, since after thinking carefully using ammo in a turn based game could make the battles too slow. There can be different ammo types but not the need to recharge the weapons. About the story, as said elsewhere I'm going to write down the main plot as I code the game like I did with the first, and then with Miakoda's help will review/improve it and also do the romance routes (for that I'll probably let her do all the work and only suggest some ideas). I honestly don't think will be out next year, but at least now I'm starting to work on it "seriously"!! This time should have a better writing too! Woo, it's been a long wait for this one! Yes was probably one of the first games I announced back in 2011 I think. Though things are for the better: now I have a good RPG framework to use (yes it's still Loren/SOTW one, but I can use it to make a good sci-fi RPG) and my skills overall improved, Ren'Py is better (I can do more cool stuff easier now) and I have a writer/friend like Miakoda who will be a great help in editing/writing/helping with the story in general. Haha I still have a prototype I made back in 2011 where my super RPG engine had the amazing new feature of... damaging multiple targets! Yes because the original game didn't have this feature Beside that, the framework I coded was using a mix of old/new Ren'Py code and could probably break if I tried to update it. 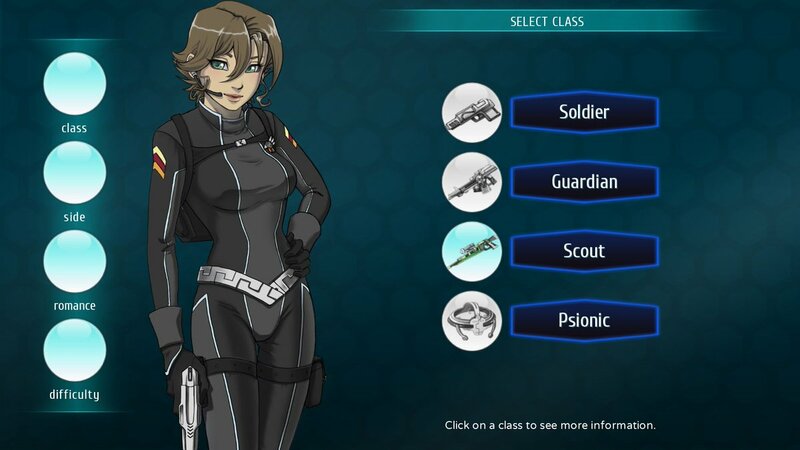 class selection screen! Actually should say "sub-screen" since in this single screen you choose all the items on the left, Class, Previous Game Side, Existing Romance, Difficulty. I thought you had some writing done for PS2 already. What happened? I was really excited for the new RPG framework, but considering how long the game was delayed, I can respect that decision. Seriously I'm surprised I manage to release more than 1 game a year (indeed 99% of other indies making big games release 1 every 2-3 years, it's not random ). As for the framework, there was a prototype but wasn't finished. Then Anima was working on a new one which is much better and could work both for fantasy/sci-fi games (so melee+ranged attacks) but then 2 years ago had to pause it to do the card framework (which is not simple at all) and then had no time to go on. Since this game was announced so far away I really don't want to wait more. more progress! Haha I love the art and the GUI, I think they fit well together. I'm not sure if to use the wording "Use / Can't Use" or something like "Pro / Cons". Though use it's probably more immediate. 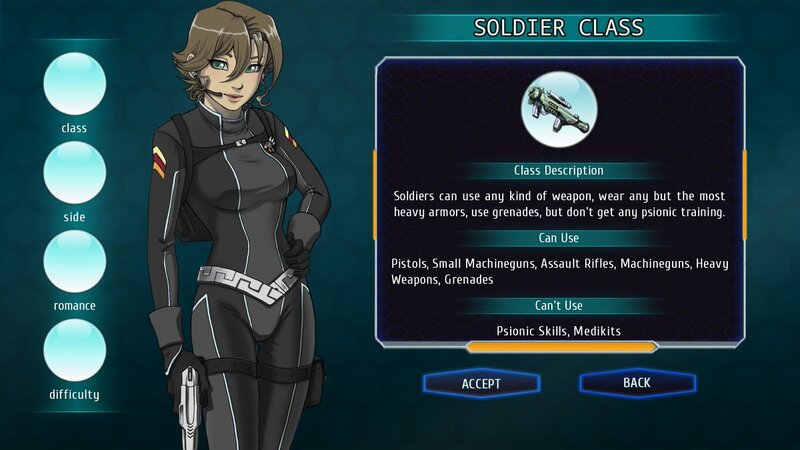 Yes Soldiers can't use medikits, but it's not set in stone, I want to have the classes very different. But if turns out to be too much of a pain I'll change it of course. "Can/Can't Use" is fine considering you are only mentioning equipment and ability use. "Pros/Cons" is more broad and can be used for describing things like HP pools, buffs, or crowd control.